A six reel, three row slot boasting a 96% RTP, and an amazing 100,000 plus ways to win. 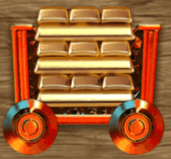 This Big Time Gaming creation is based around the concept of mining for precious jewels, and features two bonus rounds which can vastly increase your winnings. It’s one of the UK’s post popular slot games, and is right at home on the UK Slot Games website which features over 600 slot games, including ‘Starburst Slot’, ‘Rainbow Riches’, ‘Fluffy Favourites’ and ‘Wolf Gold’. Put your hard hats on and find your visibility jackets, because ‘Bonanza’ is an online slot that takes its inspiration and themes from the world of mining. You’ll be going deep underground in this time, where you’ll find various precious stones of several shapes and sizes (more on that in a moment), all of which can bring you rich prizes if you find them in the right combinations. The game is visually pretty; the concept of the mine has been realised very well, with a surround of grassy rock, along with some pits and a waterfall to add to the atmosphere. On the reels you’ll find the traditional 9, 10, J, Q, K and A making up the low value symbols, but what you’ll really want to see is a diamond, or one of the red, blue or green gems. Those precious stones are worth something, just as they are in the real world (as opposed to ‘the reel world’). Sticks of dynamite work as your wild and substitute for everything except your scatter letters, which are ‘G’, ‘O’, ‘L’ and ‘D’. No prizes for guessing what that spells, but there are prizes for finding them all. We’ll come to that later. What really and truly makes this slot special is the unusual reel structure. This game has a mind-blowing 117,649 different ways to win. How is that possible? Because the symbols can be of various different sizes. As any experienced miner will tell you, some jewels come out large, and others come out small. That’s exactly what’s going on here. That means there can be up to seven different outcomes per reel. On top of that, the game makes innovative and original use of its scenery to add an extra layer to the game; all of the reels spin underground, but above them you’ll see there’s a mining cart. The function of the mining cart is to add an extra symbol to the second, third, fourth and fifth reel every time you spin. Some games just use their theme for the sake of scenery. ‘Bonanza’ makes it part and parcel of the whole playing experience. There are only two bonus features in ‘Bonanza’, but don’t let that put you off. One of them is really worth writing home about. 1. Free Spins: Free Spins is a mode you should expect from any modern online slot, and ‘Bonanza’ is happy to offer them to you. Land four of the letters that spell out ‘GOLD’, and you’ll bag yourself twelve free spins. Every additional scatter symbol you find during those twelve spins awards you an additional five. You could be in free spin mode for a long, long time; which gives you ample opportunity to find a way to win. Let’s be honest; there’s no shortage of those! 2. Reactions: Reactions is the mode that’s the most fun to play, though. It has more than a little in common with the classic game of Tetris. Every time a symbol on the reels is involved in a winning combination, it vanishes from the screen and is replaced by new symbols falling in from above. If you chip away at the rocks when you’re mining and some fall out, you have to be conscious that something else may also come away behind them. That’s exactly what’s going on here! Each time new symbols appear, they’re valid for making new winning combinations, and this will continue until there are no more winning combinations left on the screen. If you hit a lucky streak, they’ll just keep on coming with no input from you at all. Big Time Gaming are no newcomers to the market; they have a range of successful games under their belt, and they’ve been making them for some time. They also have an impressive trio of talented industry leaders at their helm; Nik Robinson, their CEO, has been involved in online slots since 1996, having founded a company and sold it to media giants News Corp before becoming involved in Big Time Gaming. CTO Huw McIntosh has been working in the sector for well over a decade, often side by side with Robinson, and then there’s Creative Director Ian Schmidt, who joined Big Time Gaming from Rockstar Games. If that name sounds familiar to you, it’s because they’re the company responsible for ‘Grand Theft Auto’ and ‘Red Dead Redemption’. Schmidt’s eye for video-game style is evident on several of the Big Time Gaming titles. Big Time Gaming are currently very excited about their new ‘Who Wants To Be A Millionaire’ themed slot, which is a fresh take on a title which has been seen on the online slots circuit before, and is scheduled to launch at the start of 2019. In the meantime, players can enjoy their existing back catalog, which as well as ‘Bonanza’ (which is arguably their most successful product), also includes ‘Extra Chilli’. The dynamic and exciting company are no stranger to picking up awards. In the 2017 Meister Awards, Big Time Gaming picked up both the number one and number two slot in the ‘Best iGaming Software Experience’ category, for ‘Bonanza’ and ‘Danger High Voltage’ (another of their more popular releases) respectively. “Bonanza is one of Big Time Gaming's greatest creations to-date with the combination of Reactive Reels and MEGAWAYS™, it creates a whole new variety of gameplay never seen before in gaming. The resulting combination brings a rich and exciting gameplay experience to the world’s leading online Casinos. The 117,649 Ways game is set in inside a beautiful mountain diorama, with the action firmly set on how many symbols land in position. Dual reactions - also a new feature - are formed by mining carts that move horizontally to react with the vertical reels. The more symbols that land in the reels the more reactions take place, making for tremendously engaging game play. Whilst there is (understandably) a degree of hype to that commentary, given that it’s their own press release regarding the game, much of what is said is accurate; it’s a well executed and ingeniously devised game, meaning it wouldn’t be out of place in any of the world’s leading online casinos. And that’s exactly why we offer it here at ukslotgames.com. Bonanza is barely two years old. Because of that, it hasn’t yet had the opportunity to develop a family of games around it. There seems to be little doubt that it will; games that are this successful never go without a follow up, and Big Time Gaming are probably cooking something up for us whilst we speak. There are some people out there on the internet who believe that ‘Extra Chilli’, which is another Big Time Games offering, is actually ‘Bonanza 2’. It isn’t. It’s just a game that plays in a very similar style, with a completely different theme. In that way, it’s no more of a sequel to ‘Bonanza’ than any of the Marvel slot games are sequels to each other; it’s just the same engine with a different skin. There are a few games which are similar, though. Whether that’s because they were inspired by ‘Bonanza’, were created at the same time as ‘Bonanza’, or are just outright copies of ‘Bonanza’ depends on how you look at them. Here are the ‘Bonanza’ related titles that you’re most likely to encounter. Given that we just mentioned how similar it is, it would be wrong not to mention ‘Extra Chilli’ as a related game to ‘Bonanza’. The most correct way of looking at ‘Extra Chilli’ would be to see it as a ‘sister game’, a unique entity in its own right that shares many connections and bonds with its sibling. It operates on the same mechanical principles; six reels, seven rows, and 117,649 ways to win. Given that both titles were made by Big Time Gaming, that’s not a major surprise. Instead of being set inside a mine, ‘Extra Chilli’ takes its players inside the world of Mexico and Mexican food, with a mariachi soundtrack to go with it. The reels and bonuses work exactly the same as they do in ‘Bonanza’ with one tweak and one addition; only the letters ‘H’, ‘O’ and ‘T’ need to be found as scatters to start the ‘Free Spins’ bonus (there had been some criticism that the ‘D’ is too hard to find in ‘Bonanza’), and a ‘feature drop’ which builds up every time a gold coin appears on the reel. This is a different take on a mining-themed online slot (whoever thought that would become a genre? ), brought to you by Aristocrat Games. The first thing you notice when loading it up is that it’s nowhere near as pretty as ‘Bonanza’. That’s no surprise; ‘Bonanza’ has a team of experienced video game manufacturers behind it, and is only two years old, so it’s been designed with the modern player in mind. ‘Where’s The Gold’ is more of a traditional slot game; five reels and three rows. 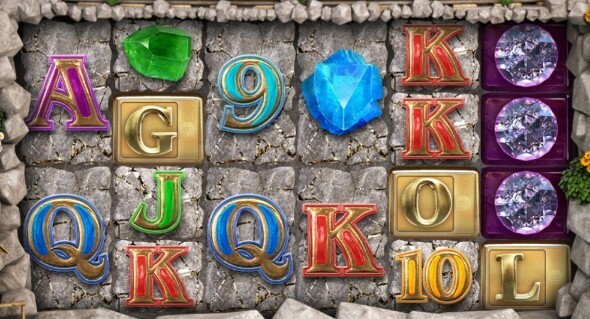 In terms of bonuses, there’s a ‘Gamble’ feature where you can bet your winnings on the turn of a card (up to five times in a row if you’re really feeling lucky), and a quirky take on ‘Free Spins’ where finding the right combination of scatter symbols takes you to a completely different spin-based mini-game. It’s innovative, but it’s not as much fun as Reactions in ‘Bonanza’. Also there are far fewer ways to win. 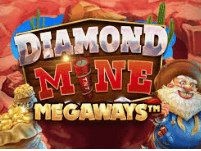 Interestingly, one of the closest online slots out there at the moment to ‘Bonanza’ is actually another Big Time Gaming slot; namely ‘Diamond Mine’. Visually, this looks like a ‘no frills’ version of ‘Bonanza’. The premise is the same, the setting is the same and the functionality is the same, but it’s just not as slick or smooth graphically. This might be best explained if ‘Diamond Mine’ was a prototype for ‘Bonanza’ but it isn’t, it actually came out afterwards. Whatever Big Time Gaming’s motivation for launching the game was - perhaps to make it easier to load in a mobile gaming format? - almost everything is identical; the ways to win, the extra symbols on the reels, and the bonus rounds, with the exception of an additional ‘TNT’ symbol which can appear anywhere on a reel and then explode, leaving behind a new symbol which matches the one next to it, and therefore pushes you closer to a win. It seems like every gaming company has a mining title within their portfolio, and Pragmatic Play are no different. This game feels like it takes you to a specific era within the history of mining; specifically, the 1800s. That’s backed up by the old, grey-bearded prospector who appears on the reels. If you think that makes the game likely to be an old-style, traditional affair, you’d be right. Five reels, twenty five paylines, and the ability to add more prospectors to your reels by collecting gold nuggets when they appear. Needless to say, the more prospectors you find, the more chance you have of winning big. The sound effects are good, the graphics are evocative, and it’s a solidly functional slot game. If you’re more into the ‘pretty jewels’ than the ‘digging for treasure’ aspect of ‘Bonanza’, then ‘Hot Gems’ might make for a similar game in your eyes. There is still a touch of the mining world around you as you play; most notably via the presence of a prospector holding onto a shiny rock as a symbol on a reel. The Net Ent slot game is probably one of the earliest examples of a ‘collapsing’ feature, the same principle that underpins the ‘Reactions’ bonus in ‘Bonanza’. Find a winning combination, and the symbols that make up that combination will collapse and be replaced by new symbols falling from above. That process continues until there are no more winning formulas to be found. This may not be the earliest ever instance of that feature appearing on an online slot, but it’s definitely one of the earliest. It’s not as advanced as ‘Bonanza’; and that’s just down to the time that’s elapsed between the games being made, but it’s a very playable game. You would expect a game that was designed within the past couple of years to be perfectly functional on a smart phone or a tablet, and ‘Bonanza’ is. Everything about the original game makes it across to the mobile version, including the charming banjo-plucking soundtrack. Adapting the game means that the stake adjustment button, the menu button and of course the play button are aligned across the very bottom of the screen, and they’re all a nice size for thumbs or fingers. In short, you’ll have no difficulty playing the game on a smartphone whatsoever. If we were going to make a minor quibble, it’s that the options that appear when you press the menu button could probably have been made a little bit larger when you’re playing the game via a vertical display. They’re legible, but they require precision finger work if you want to make any adjustments there. That won’t make any difference if you just want to play the game as it’s designed to be played, though. In another neat trick, if you flip from vertical to horizontal, the font size increases anyway, and all of the buttons go from their exile at the bottom of the screen to your right hand side; re-integrating themselves with the play area. That’s intelligent design. As a popular slot game designed by a gaming company that really seems to be going places, ‘Bonanza’ and the people who make it have made their way into news articles in recent times; either directly, or via mention. Here are some of the latest developments that people have found newsworthy. Casinobeats, who would best be described as an electronic newsletter for the online slots world, picked up on Bonanza earlier on this year and noted with excitement that the game would soon be playable on the Microgaming Quickfire platform. This was seen as a big plus for Microgaming, and the article was particularly enthusiastic about Big Time Gaming’s patented ‘Megaways’ mechanism; whereby reels are modified randomly, and any spin can result in a different number of symbols across those reels. The mechanism, which can only be found in Big Time Gaming slots, is thought to greatly enhance the playing experience. Big Time Gaming’s exclusivity on the ‘Megaways’ system may not last much longer though, according to another report. And that will be down to their own choice! Gaming Intelligence reported in October 2018 that Big Time Gaming had reached a deal with Red Tiger Gaming that would allow them to incorporate the intellectual property into their own games, and therefore benefit from the same functionality. From the outside, it looks like a head-scratcher, as it’s a case of one slot game design company selling one of their most unique properties to a rival firm. We’re left to assume that the money on the table for making the sale much have been too tempting to resist. iGaming Business sees only good things in the future for Big Time Gaming. The publication was very positive about the performance of ‘Bonanza’, and at the time of writing it was even more excited about the impending release of ‘Extra Chilli’. The company as a whole were said to be ‘on fire’, which more games up their sleeve. This article was written before Big Time Gaming got their hands on their new ‘Who Wants To Be A Millionaire’ license, so if the industry was excited back in April, things have probably reached fever pitch by now! Why Is UK Slot Games The Best Place To Play Bonanza? Hopefully by this point, you’ll have a good understanding of ‘Bonanza’ and the people who made it. You’ve come to the ukslotgames.com website to read this review, and thank you for doing so. But why should you stick around and play the game at UK Slot Games instead of elsewhere? There are many good reasons, and we’re happy to tell you! Firstly, ‘Bonanza’ is just one of hundreds of high quality slot games that we host here, and we charge no deposit for you to sign up and browse them at your leisure. You can inspect our full library without paying a penny. When you do sign up, we’ve got some great incentives to reward you. Your very first deposit will win you anything up to 500 spins! Not only that, but every time you deposit a further £20 or more, you’ll be rewarded with even more free spins. On top of that, there are daily cash-back prizes of up to 10%. We’re constantly looking to find new ways to reward our loyal customers, and that means sometimes you’ll find us offering you ‘Happy Hours’ for playing, Amazon vouchers and even free pizza! All deposits we process are safe and secure, and handled through PayPal. That means we’re committed to safeguarding your money, we’re always happy to give you free incentives when we can, and we’re constantly looking to go the extra mile to give you a truly excellent slot game experience. We at UK Slot Games want to be the number one name in the UK slot gaming market, and we can only do that if you love us and stay with us. That means we’ll do everything we can to make you happy, and keep it that way! Even though it’s been around for a while now, Starburst is still one of the most popular games on the UK slot games market. Most online casino sites who offer it will feature it on their front page, because they want potential customers to know that it’s on offer. Only quality online casinos get access to Starburst, so they wear it like a badge of honour. Because it’s held in such high regard, it still makes it into the news every now and then; both industry news and more mainstream.